Looking for a gift for the book lover in your life (even if that book lover is you)? 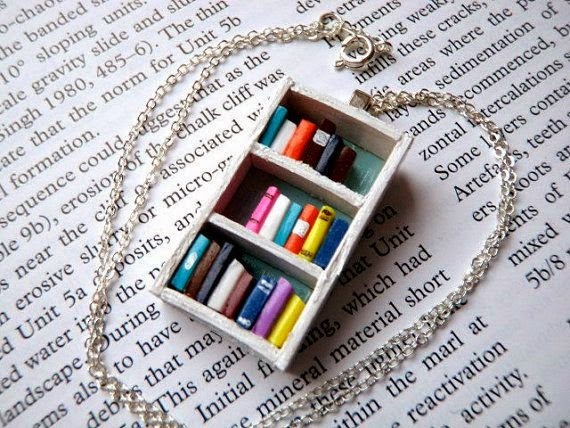 Bibliophiles and Etsy-ophiles alike should definitely check out the store Coryographies. It's the work of Oxford-based Cory Cuthbertson, a lady who definitely shares an addiction to books. 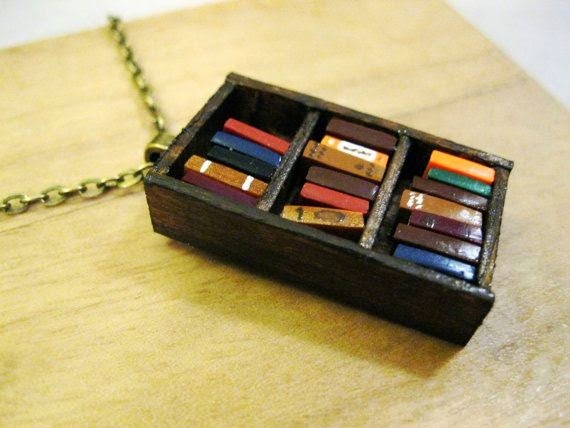 Cory creates amazing miniature bookcases using wood, polymer clay and paint. 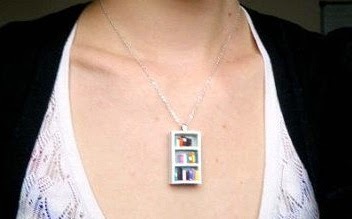 These aren't intended for doll's houses, however: they're necklaces, brilliant miniature wearable pieces of bookish art. Each bookcase stands/sits (?) 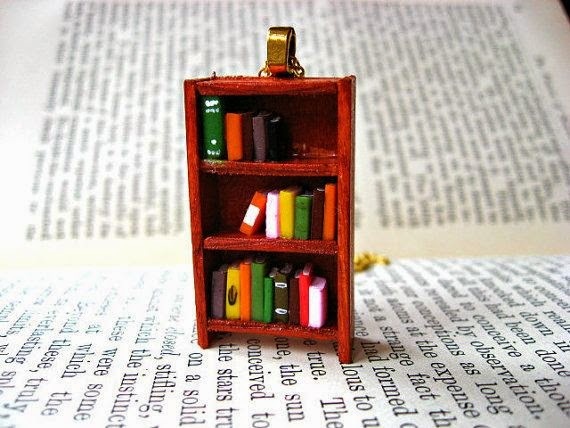 at just under 4cm high, and they come in an array of styles, depending on your favoured kind of bookcase. Because if you care about books, you're bound to have an opinion about bookcases. Above is my favourite, the maple sugar bookshelf. More into your classics? This antique bookshelf may be the one for you. And, perfect for summer and lazy holiday reads is this beach house necklace. This is what they look like on: pleasantly noticeable but thankfully not like you're hefting around an actual bookcase round your neck. Each design comes with either a gold or silver-plated chain, depending on the design (although you can request that this is switched), and are priced at £28 each. There are a few more treats in the shop should you get beyond the bookcases: all happily and suitably bookish. What could make me more chuffed with life than sitting down to treat a great Penguin classic? Sitting down to read a great Penguin classic with one of these vintage Penguin book ring on my finger, that's what. It's £15 and, to me, is every bit as much as a head-turner as a page-turner. 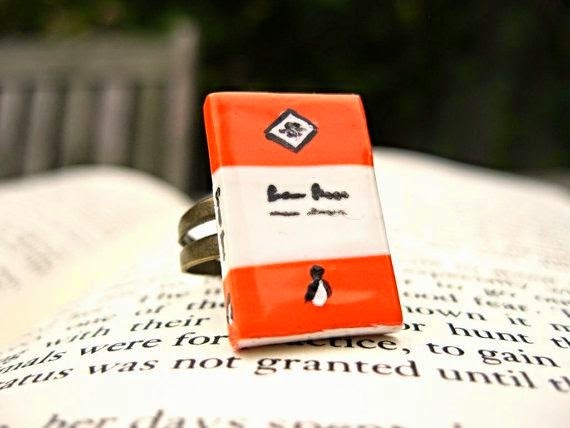 I would marry any man who proposed with a vintage Penguin book ring. I'd probably say yes if he offered me just a vintage Penguin book.